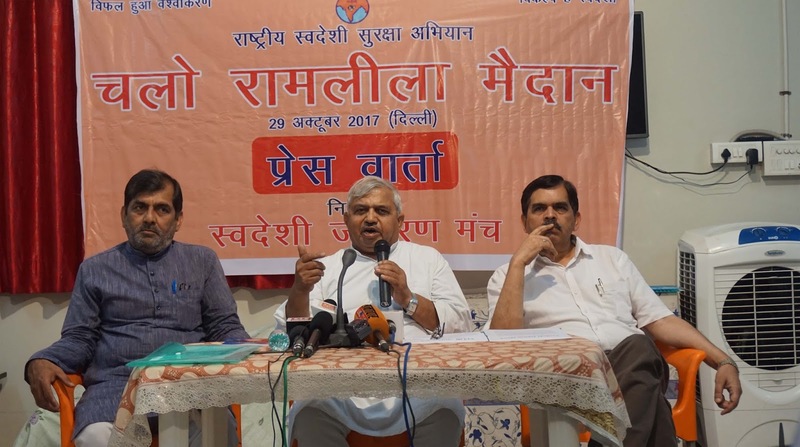 Press statement of Shri Kashmiri Lal, All India Organiser of Swadeshi Jagran Manch issued during his press conference on September 7, 2017 in New Delhi. New Delhi, September 7, 2017: China is responding to India’s principle of Panchsheel by adopting the policy of ‘panchshool,’ which is taking on India by crippling our economic, environment, employment and humanity fabric. 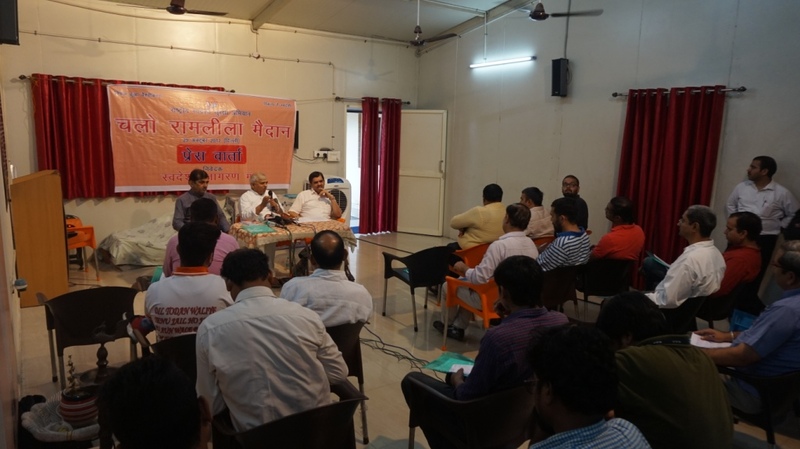 To make people aware of China’s nefarious designs, the Swadeshi Jagran Manch (SJM) has launched Rashtriya-Swadeshi-Suraksha Abhiyan from January 12, 2017. 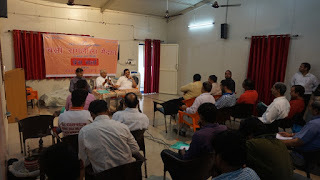 Under this campaign over one crore people have given their undertaking in writings to boycott Chinese goods. In this regard, a memorandum was given to the Prime Minister at 500 districts between August 9 and 10 though District Magistrates. A number of protest marches, dharnas, rallies, public meetings and burning effigies of Chinese goods took place during this period. As many as 8 lakh copies of books and 3 crore handbills were also distributed in 10 languages during this period. 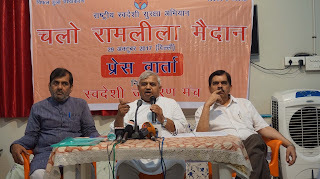 It is important to note that Rashtriya-Swadeshi-Suraksha Abhiyan has got the support of people from different walks of life including Baba Ramdev, artistes, senior functionaries of RSS, Governors, members of Parliament and state Assemblies, leading figures from industrial and labour organisations. Our efforts have resulted in the Central government imposing anti-dumping duty on a number of Chinese goods including 18 per cent on the import of steel from China. SJM would like to like to highlight the fact that the unhindered import of Chinese goods is causing a huge damage to Indian economy in more ways than one. Small scale units are getting closed. Job opportunities are shrinking. China’s contribution to India’s annual trade loss is US $ 52 billion out of US $ 118 billion on account of 190 countries. China’s share in world’s manufacturing market has gone up to 22 per cent, while that of India is only 2.1 per cent. It is equally important to note that China is earning a trade profit of Rs 4 lakh crore per annum from India. If all other Chinese trades are included, China’s total trade with India will come to Rs 6.5 lakh crore and if we calculate the net profit at the rate of 12 per cent, the China is earning at least Rs 72,000 crore net profit from India. Still China is disturbing India on all global platforms—from blocking India’s entry into NSG to Dokalam to Azhar Masood to other border issues. SJM’s Rashtriya-Swadeshi-Suraksha Abhiyan would conclude on October 29, 2017 at Ram Lila Ground in New Delhi in the form a huge rally. A large number of important people from different walks of life will attend the rally. We hope that this rally would give a new direction to India’s economic policies and will also help us chart out our future course of action.